Not all dogs are a fan of traveling in a car. An aging pet or even a small breed dog will require assistance when climbing up and down the car. Hence, you should consider investing in a portable dog car ramp. It could be your physical limitations that would make climbing inside the vehicle difficult for your dog. 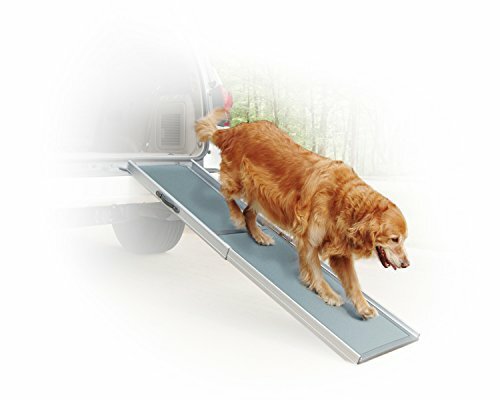 Dog car ramps are portable and easy to carry, making it ideal for both indoor and outdoor use. 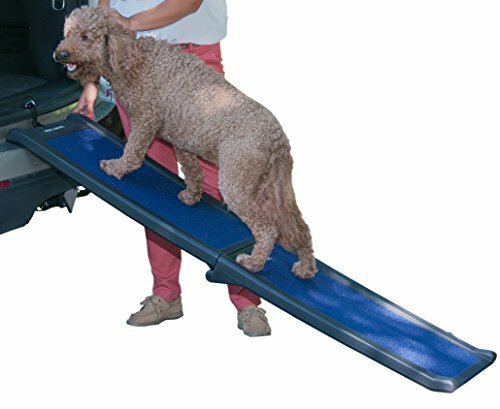 So, if you are a pet owner looking for the best car ramp for your dog, allow us to present the top 10 best portable dog car ramps in the market today. Pet Gear is known for their quality and excellent customer service. This Pet Gear free-standing ramp is suitable for both dogs and cats. When not in use, you can fold the ramp without difficulty. It featured rubberized bottom grippers for secure placement and added safety protection of your dog. For sure footing, it has a slip-resistant surface that assists your dog as it climbs. This dog ramp can accommodate canine weighing up to 300 pounds. Since it’s a carpeted ramp, it’s an ideal choice for pet parents who have dogs with long nails. It is gentle and does not hurt your pet’s paws as they walk unto it. You can remove the ramp easily if you want to wash it once it gets dirty. The Pet Gear Travel Lite Ramp will allow you to travel with your buddy anywhere you want. It features a soft SupertraX mat that can protect both your dog’s paw and the auto interior. Once it gets dirty, you can quickly remove it for cleaning maintenance. The pressure activated grip will allow your pet’s hand to grip the mat and provide sure-footing efficiently. This ramp also has elevated edges, reducing the risks of your pet slipping off the side. An integrated handle is engineered for easy folding and portability. The ramp can accommodate dogs weighing up to 200 pounds. Its patented tri-fold design makes this ramp the perfect partner for travel adventures with your dog. Another known manufacturer when it comes to dog gears is the Solvit. Allow us to introduce the PetSafe Deluxe Telescoping Pet Ramp that’s both lightweight and durable. It only weighs 13 pounds, making it a great travel tool. You can use it fully-extended if you have an SUV or pick up. This pet ramp can accommodate dogs weighing up to 400 pounds. Even the most enormous dog will feel safe using this product. It also features guide rails that are raised on both sides of the walking surface to keep your dog secure while they’re climbing the ramp. You can extend this ramp from 39 inches to 72 inches, ideal for using in SUVs and pickup trucks. With proper use and maintenance, rest assured that this heavy-duty ramp can last for many years to come. 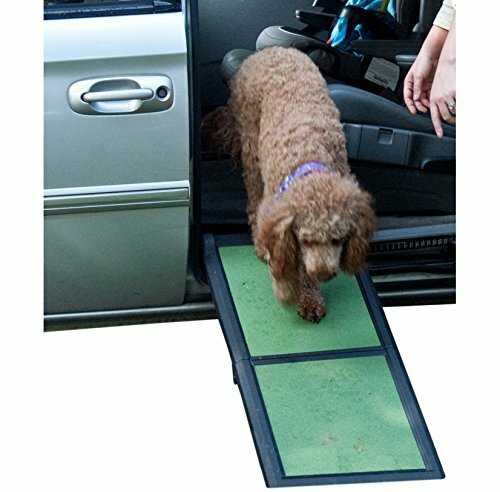 Getting in and out of your car is made more accessible by the Gen7Pets natural step ramp for pets. Thanks to its poly-grass surface, your dog can grip on tighter while climbing inside your vehicle. Compared to other products, it’s not rough and provides optimal comfort to your buddy. Its soft surface will not cause any scratching to your pet’s paws. Furthermore, the grass is soft to the touch of the pet parent and will not scratch the interior of the vehicle. 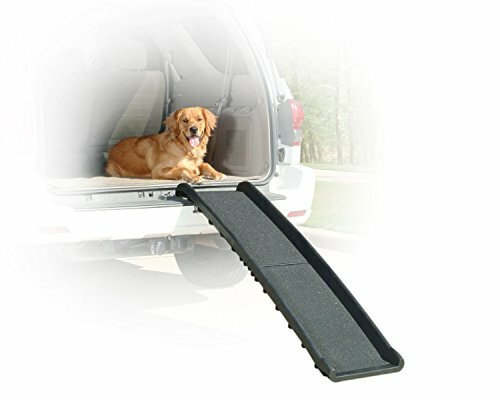 If you love traveling with your dog, this lightweight and easy-to-use step ramp is for you. When not in use, you can fold it and store the ramp at the back of your SUV. Also, it is one of the most extensive slopes in the market that features 72 inches—making your pet more comfortable. The automatic locking latch secures the ramp close to reducing the risks of any dog injury. If you are on a budget, you might want to check out the Pet Gear free-standing ramp for cats and dogs. It features a pressure activated grip that will allow your dog’s paws to grip into the mat for sure footing easily. This ramp uses the supertax mat. It’s soft and will not scratch your pet’s paws. The rug will not also cause any damage or scratches to the auto’s interior. You can remove it afterward for easy cleaning. The patented free-standing design is convenient. The ramp will support itself and will not need any vehicle or furniture to lean on. When not in use, you can fold the ramp for a compact storage and portability. It has elevated edges that can prevent slipping off the side. 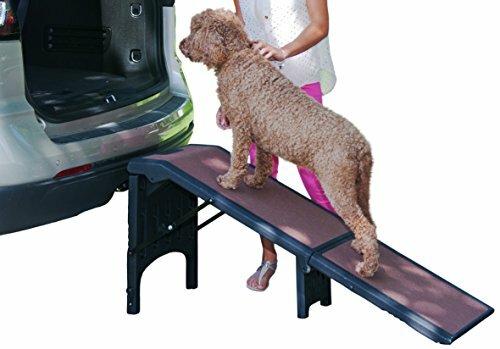 For pet parents who are always on the go with their buddies, you might want to check out the Pet Gear Tri-Fold Ramp that can accommodate both dogs and cats weighing up to 200 pounds. It features high-visibility reflective material aids that can guide your pet up and down the ramp. This ramp also has side safety reflectors for maximum visibility while your dog is using the ramp. For their safety, it has a slip-resistant surface for sure footing and rubber grippers on the bottom that keeps the ramp stable. This tri-fold ramp is easy to fold for secure storage. This is an ideal ramp for as it consumes little space at the back of your SUV. This carpeted ramp provides optimal comfort to your dog as they tend to dig their nails while climbing. You can remove the carpet tread afterward when it gets too dirty. 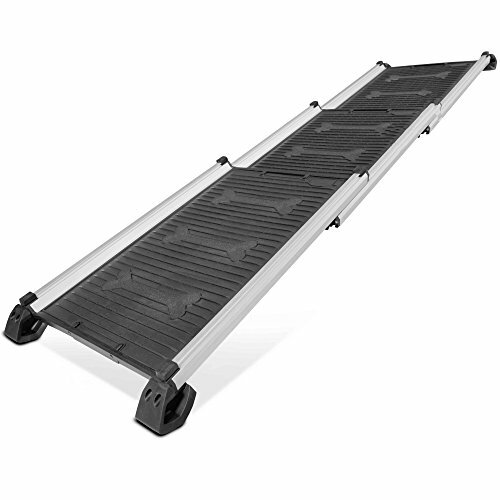 The Pet Gear travel lite bi-fold ramp features a slip-resistant surface for sure footing. When not in use, you can quickly fold the ramp into two for compact storage. The bottom of the ramp has rubber grippers to keep it steady while on the application. 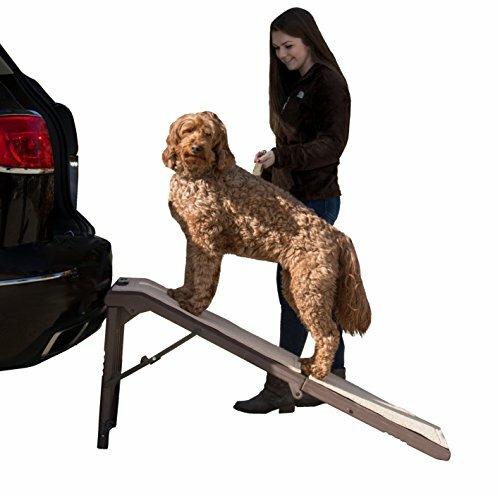 This reflective ramp provides extra assistance and safety to your dog when climbing in and out of the car. It also has high-contrast markings that will serve as the guide for your pet when using the product. Note that this ramp is not suitable to use at the rear of the vehicle loading because the angle of the ramp will be too steep for your dog. 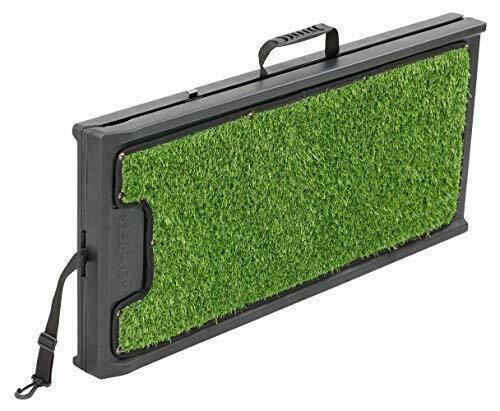 If you are looking for a lightweight and durable dog ramp, you should check out the Solvit PetSafe Ultra-Lite Bi-Fold Pet Ramp. 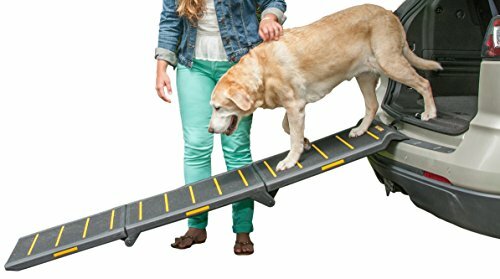 This ramp only weighs 10 pounds but can accommodate dogs up to 150 pounds, making it an excellent tool for travel purposes. Thanks to its space-saving design, you can carry it around without difficulty and can be stored at the back of your SUV. It also features a high-traction walking surface that provides a textured surface just like what you see on truck beds and skateboards. In that way, your dog can avoid slipping in the process. This ramp is suitable for older dogs or those who have limitations of their mobility. The indentions beneath the railing make it easy to handle. It also features a safety release latch that can prevent accidental openings. We also have the Titan 28-61 Telescoping Collapsible Pet Ramp. 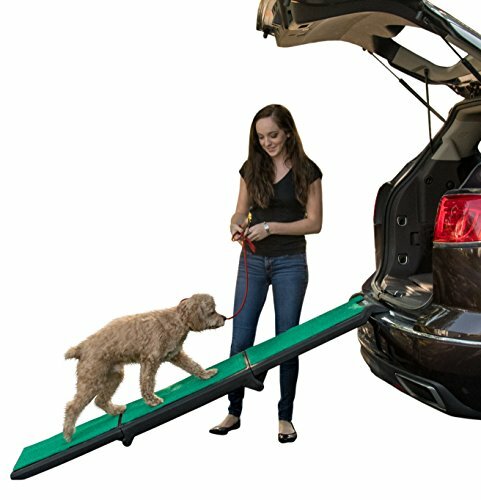 This collapsible pet ramp will allow you to travel with your dog anywhere you want. Regardless if you have a small or big dog, this ramp can accommodate canine weighing up to 180 pounds. Its three-section construction can collapse and doesn’t take too much space at the back of your car. Furthermore, it has an aluminum frame and rigid construction that can provide excellent stability in the long run. It has a grooved surface and large rubber feet for sure footing. The slow and smooth expansion allows you to operate the ramp using one hand only. For our last product, we have the Pet Gear Travel Lite Bi-Fold Ramp for cats and dogs. It features a slip-resistant surface for sure footing of your canine. Its space-saving design allows you to fold the ramp easily when not in use. Just stash it at the back of your car, and you’re ready to go. The bottom of the ramp features rubber grippers to keep the ramp steady, even if you have a heavy-weighted dog. The maximum capacity of the slope can reach up to 150 pounds. This ramp is easy to use and ideal for older dogs who are suffering from joint issues.